Content is at the heart of all corporate communications and experiences and is fueling a demand for content across all physical locations and virtually. In the physical spaces, corporations capture digital content for displays in client engagement areas, corporate work spaces, cafeterias, lobbies and other gathering places. Corporate communications reports this messaging is equally important to both visitors and employees. In the marketplace, content differentiates companies because it communicates your brand, products and services at tradeshows, your on-line presence on social media and in other interactions. It influences whether customers choose to do business with you or your competition. Client Centers (EBCs, Innovations Centers, CBCs, Experience Centers, etc) are no different; the demand for content in Centers is insatiable. We deploy personalized signage to welcome guests as they enter and guide them along their journey through the Center. In the briefing rooms customized content is the backbone for discussions. During demonstrations and tours the digital content, often interactive, shapes a memorable experience. 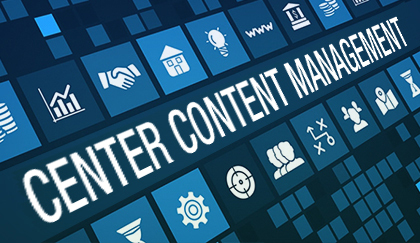 Across all enterprises creating and managing content is a demanding, time-consuming and expensive mission. The B2B Marketing Exchange refers to the demand for content as “feeding the beast”. Content isn’t created one time and you are done, instead content needs to be continuously updated, polished, retired and replaced. Other complications are data formats with platforms and technologies constantly evolving and not all are compatible. The challenge of keeping content current is never ending. When customers or prospects visit a Center, they believe your company has a solution to their challenge. They travel to your Center to spend their time with you. If the customer shows up and they hear canned presentations or generic product or service pitches, your guests will likely feel their business is not very important to you. Research and case studies prove if a company provides the customer an experience that is collaborative and customized to their needs, customer loyalty and consequently sales increases. Content is what will set the experience your customers have in your Center apart from your competition. Content will define how you relate to your customers, and whether your customers choose you over everyone else. There is not one best effective and efficient way to manage content. Different companies and departments control their content assets in their own ways and often in isolation. In our next three Strategies for Managing Client Center Content blogs we will discuss best practices for Client Center professionals to mine meaningful content and leverage it to enhance their customers’ experiences.